The film was so iconic of the times that I never really paid much attention to the TV spinoff starring Carrol O’Connor; Archie Bunker from TV’s “All in the Family”; figuring that aside from the name of the series, there wasn’t much potential there. And, aside from that, what could ever top the scene where Tibbs; played by Sidney Poitier; smacks back the town’s oldest revered segregationist in his very own green house? Howard E. Rollins Jr. plays Virgil Tibbs in a very convincing manner, while never making you feel as if he is trying to emulate Poiter’s treatment of the role. Well, last night (actually a few nights ago by the time you read this) I decided to check the series out, beginning with the 2 part Pilot episode, which sets up the whole series based upon the movie. I was pleasantly surprised. The hardest part of adapting any type of movie or show to another genre; particularly television; can be a road fraught with pitfalls. It’s so easy to take something millions of people have come to love in its original form and screw it up. However, I was pleasantly surprised at the way they adapted this story for the pilot. I still haven’t begun the rest of the series, but the pilot is really well done. To begin with, picking Carroll O’Connor for the role of Gillespie was a great choice. And the way they bring Tibbs back to Sparta for his mother’s funeral is fairly believable. The only real discrepancy is that in the film Tibbs was visiting his mother in a neighboring town, hence the need for the train connection. In the series she appears to have been a longtime resident of the town, which raises all kinds of questions about why he was portrayed as a stranger passing through in the film. These differences aside the pilot is beautifully executed. 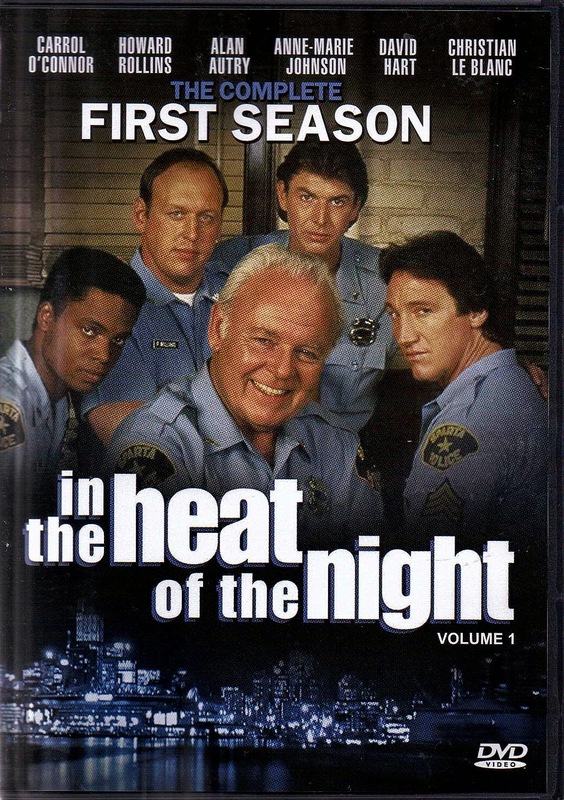 They even have a scene where Tibbs gets to reiterate that they call him Mr. Tibbs after being called boy by Deputy Bubba Skinner; played by Alan Autry. This is good because it gets that whole image out of the way and allows the series to take on its own flavor. They must have done something right as the show ran from 1988 through 1995 drawing praise for the entire run. What can I say; sometimes it just takes me a while to catch on to something good.